Guess the dress: Identify the actress wearing each gown. 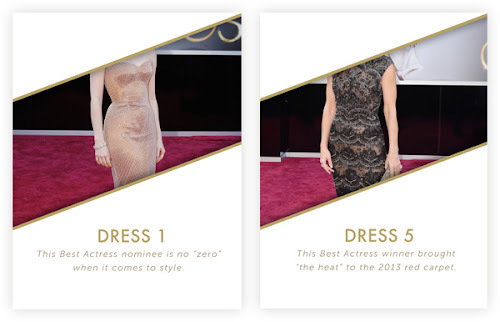 What's Your Red-Carpet Style Personality: Find out which celebrity is a match for you. Apparently I am "Jennifer Lawrence aka The Sexpot Next Door." Yep, that's me. Test your Oscar knowledge: The Chicago Tribune's annual trivia quiz. Which 2014 Best Picture Nominee Are You: A crowd pleaser or an indie darling? I got Her. "At your best, you’re quirky and charming. At your worst, you’re a real downer to be around." Fabulous. The Oscars: Can You Complete the Speech? Fill in the missing words. And don't forget to download your printable ballot and bingo game for Sunday's telecast. Have a fun weekend! Gold? Is that what color dress you're wearing Sunday? Yes! Didn't I show it to you?! NO. It means I beat everybody else to the podium. I also get bronze. So ha! Oh man. She's gonna get a big head now. It's already big. I'm the only reason people keep coming back here, y'know... I have a lot of fans! Fine. I'll stop paying you, too. Oh, shoot. I guess I blew that one. Anybody need a blog commentor??? Apparently I'm JLaw as well. And I didn't even know who the shoe people were in the quiz. Why didn't they have flip-flops-with-bling? I'm Cate Blanchett aka Edgy Glam. I was assuming "statement shoes by Nicolas Kirkland" meant Keens sneakers. Can't wait to play Oscar Bingo! Thanks for Oscar Bingo....our guests LOVED it!! Adding my thanks to the list for your Oscar bingo & ballot! They added so much to our party and I came off like a rockstar host. I pointed out to everyone, of course, that I found them on a blog called How About Orange. I've been browsing your design work too - so beautiful! I look forward to having a reason to hire you someday. Thanks! Usually on the bingo cards, the middle square is a "FREE" square.. Maybe put something obvious? Like that "Mandatory academy member presentation"..